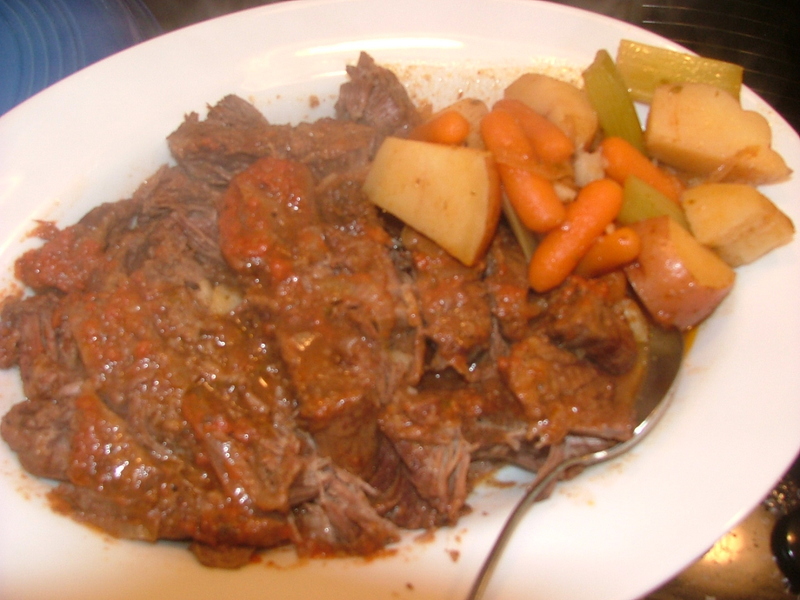 It’s hard to think about things like pot roast when it’s a gazillion degrees outside but it’s one of my favorite meals. I found this recipe in Southern Living and it’s really good. In the picture, I used regular sized potatoes and quartered them and I used baby carrots. Make small slits in the top of the roast and insert slice of garlic into each slit. Rub roast with salt and pepper and dredge in flour. Brown roast on all sides in large Dutch oven. Add onion and wine to roast in Dutch oven. Combine tomato sauce and next 5 ingredients; stir well. Pour over roast. Bring liquid to a boil in Dutch oven, reduce heat, cover, and simmer for 1 1/2 hours. Add potatoes, carrots, and celery and cover and simmer for 1 more hour or until roast and veggies are tender. Transfer roast to serving platter and spoon veggies around roast using a slotted spoon. Discard bay leaf. Spoon pan drippings over roast and veggies and serve.